The iBuddy is the latest innovation developed by the Mobotics Lab – Karma Medical’s research and development arm based in Taiwan. 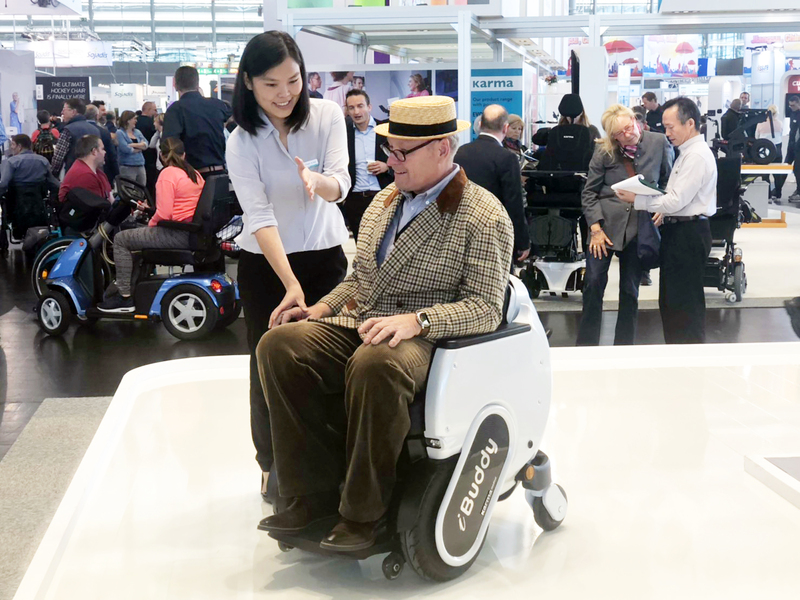 It was unveiled at major disability event, Rehacare, in Germany last month to great acclaim and was one of the stand out innovations unveiled there. The iBuddy is a revolutionary new mobility solution – a robotic wheelchair designed to follow the user around in the home or out and about. The user can also access online content and services with the smart functions on the iBuddy for increased performance and data exchange. The user controls the iBuddy from either a specialist Karma Medical wristband or from their phone via the iBuddy app. Both options have been designed by Karma to make the iBuddy as interactive and user friendly as possible as was shown at Rehacare. The iBuddy is very simple. Karma Medical believe that everyone should be as active as their age or level of mobility allows and thanks to the iBuddy, users can now leave their home with the iBuddy following and when they feel they need a rest, the iBuddy transforms into a wheelchair. This allows the user to have a break while continuing their journey and also offers peace of mind to them as well as their friends, family and carers. Besides the intuitive design for the user, the iBuddy also takes into consideration the need of carers, family members, and retailers. For example, in the case of an emergency, the iBuddy can share the exact location of the user in real time to allow for assistance to arrive promptly should it be required. “This is a fantastic example of what the R & D team at Karma in Taiwan are continually developing and we are very excited about having a prototype here in the UK in the future,” commented Mark Duffield, Karma Mobility’s General Manager. For more information on the full range of manual and powered wheelchairs available from Karma Mobility, to find your nearest retailer call 0845 630 3436 or karmamobility.co.uk.